Since its 1886 inauguration, the Statue of Liberty in New York City has welcomed millions of ship-arriving immigrants to America and has become the world's best known symbol of democracy. The 92-meter (302-foot) high Statue of Liberty is the largest present ever. It was given to the Americans by the French people as an expression of friendship and to commemorate the 100th anniversary of the American Declaration of Independence. 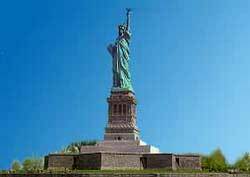 The Statue of Liberty was designed by the French sculptor Bartholdi and fabricated in France before being shipped in pieces and assembled in New York. Boats leave from Battery Park on the lower tip of Manhattan. Departures are frequent. An elevator whisks visitors 12 floors up to the top of the Statue of Liberty's pedestal, which offers a grand view of New York Harbor and the lower Manhattan skyscrapers. There's an even better view. It's when you're standing in the Statue of Liberty's crown, which requires climbing 161 steps. Unfortunately, tickets are scarce and normally need to be booked months ahead of time.